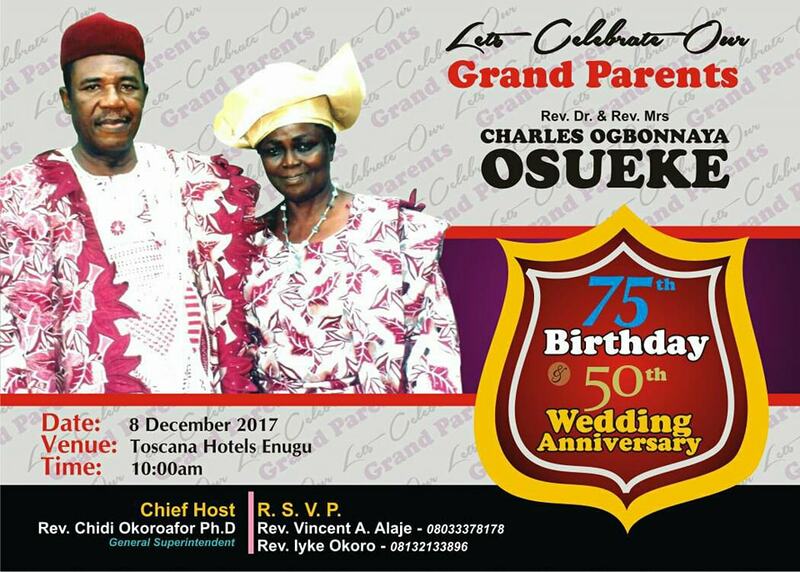 Come Friday 8th December 2017,Leaders of Assemblies Of God Nigeria,Members,Family and Friends shall gather at TOSCANA Hotels Independence Layout Enugu Nigeria as we Celebrate with our Grand Parents Rev Dr and Rev Mrs Charles Osueke . Papa Osueke will be Clock 75Solid Years and mark their 50Years Wedding Anniversary in grand Style. It is worthy of Note that Rev Dr Charles Osueke a Retired General Superintendent of Assemblies Of God Nigeria piloted the affairs of Assemblies Of God Nigeria for 22 Glorious Years and handed over in 2010.